Artwork: Maps by Ellisa Mitchell, interior illustrations by Matthew C. Nielson and Ellisa Martin, and cover painting by Darrell Sweet. For millions of fans around the globe, the wait is over. 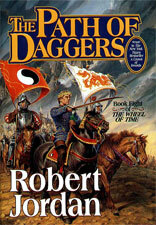 Sequel to the international blockbuster bestseller A Crown of Swords, this epic volume continues one of history's greatest fictional journeys and the most extraordinary work of American fantasy ever publishedThe New York Times, Wall Street Journal, and worldwide bestselling seriesThe Wheel of Time. Meanwhile the rebel Aes Sedai under their young Amyrlin, Egwene al'Vere, face an army that intends to keep them away from the White Tower. But Egwene is determined to unseat the usurper Elaida and reunite the Aes Sedai. She does not yet understand the price that othersand she herselfwill pay.